(SAM) We woke up the next morning knowing that the day would be special. 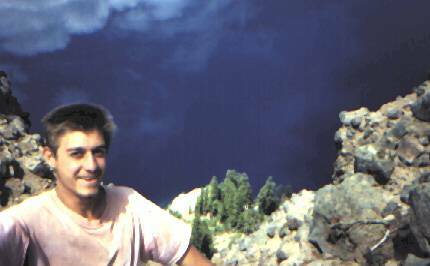 So after a breakfast of toasty-O's and a quick wash up with 10 billion below degrees water we set out for Crater Lake., After looking over a view at the overview we spent a year in the tourist shop. Then we set out on the trail which was closed to all but the Tumbleweeds because of snow. 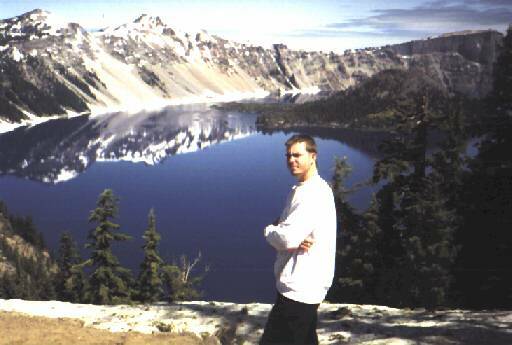 Yes Crater received over 50 feet of snow in the winter and a lot was still there. 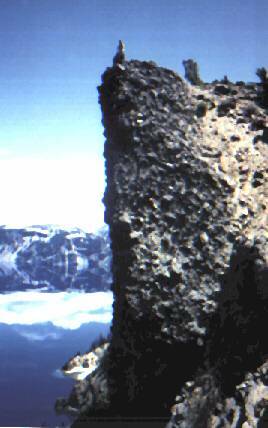 At first the going was fine and we climbed rock formations on the rim of the Crater. From this vantage point we had a good view of the entire lake which used to be a volcano billions and billions of years ago. After many violent eruptions the whole mountain collapsed upon itself. 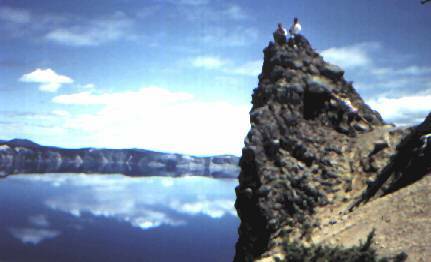 After more billions and billions of years melted snow filled the crater 1932 feet with water. 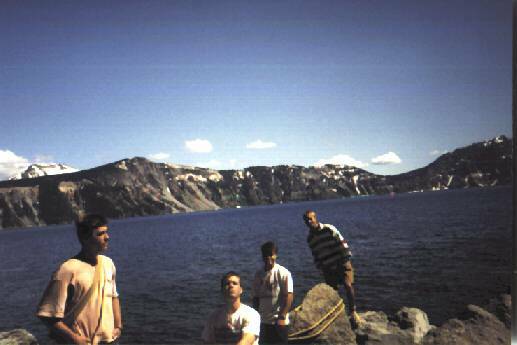 It thus became the deepest lake in America. We could also see the small island in the lake called Wizard Island. 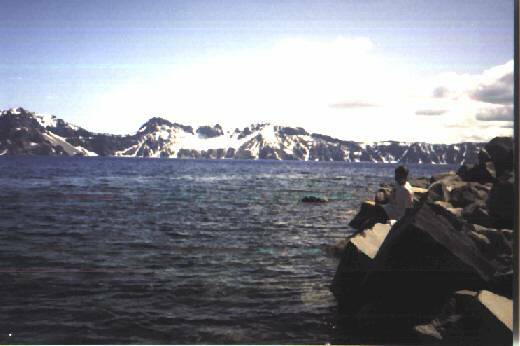 There was also a smaller rock formation near the shore called phantom ghost ship. It also must be noted that the blue water was bluer than any blue you will ever see in your life. Unless of course, you eat a blue-blue Crayola Crayon and then look at your tongue. We went further and soon discovered that the trail was covered over with an impassable pak ice which we passed. Soon our hike became so steep and snowy and white and snowy, that Chris even shed his beloved Sony to make the climb easier. 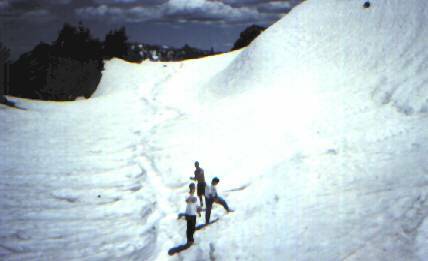 We reached the rim of the crater again and began to frolic in the snow. After spending some time on the rim we began our descent. It was great fun because we could slide down the hill on the snow. Jon filmed Chris sliding in the snow because his dad likes to see him on film. We soon came to a glacier which cascaded all the way down the side of the Mountain. Jon led the way making nifty little footholds as he went. Matt and Sam then threw a rock off the side of the Mountain and crushed Jon. (See the video.) But besides that fatality we all made it down OK. While in search for an informative film a friendly Ranger told us the one trail by which we could touch the water. So we broke for lunch and ate, you guessed it, Beans. We figured out how to split 3 pieces of bread 4 ways and set out on the second thrilling hike of the day. We raced down the trail. Sam stabbed his toe, Matt wiped out on rocks, and Jon bashed his ankle, but we all made it down safely. We climbed on rocks and touched the lake. Chris and Sam soaked their feet. On the way up we discovered nifty light rocks called pumice. 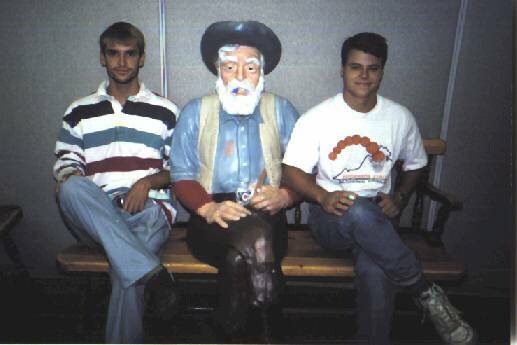 They were so cool that we collected many. They also make great gifts! The whole experience was fun fun fun. On the way out of the park we picked up the Hannye cup that Matt lost out the van window while trying to collect snow. (Oh also Jon broke Matt's favorite spoon while chopping snow to clean a pot. We had a funeral right there in the park.) 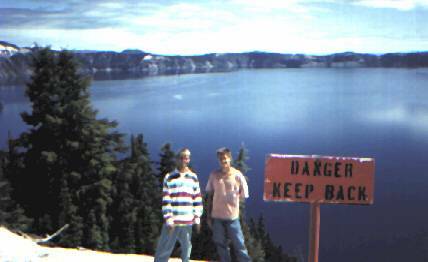 We left the park knowing that that day had been special and that we had experienced Crater Lake as nature intended it. The day was good but there were still more surprises that day. (CHRIS) Hello from Pocatello's Sunshine Laundromat. It's July 2, but let's pick up where Sam left off. All were impressed with Crater. Matt said it was the most beautiful thing he'd ever seen. We began to travel from the park in the early evening and stopped to call Rose "Bits" Parmesan in Portland. She said she would not be home tomorrow, but to call Tanya. I left a message and drove on, thinking Tanya also lived near Portland. Less than an hour later, though, I found ourselves driving through Pleasant Hill, near Eugene. This was the name of the town on her address. So we stopped and called, being only 4 minutes form their house. But I'm glad we went to the Hanson's. I think we cheered up Tanya a bit and we had a nice chat. Also--we got food! Grilled cheese (on really grainy, but good bread, which they later gave us a loaf of) and apples and raw milk and O.J. We were very happy until--Sam spilled his O.J. on the carpet. But quick-witted Tanya quelled our fears and gave Sam a nice insult to patch it all up. "It's OK, we're used to little kids here." A classic quote. After eating, we went to the back yard. Mr. Hanson had created some cool toys for the kids. First among them was the cable swing for ya! From a tree house, we grabbed the pulley and swung down through the trees to the end, where you get thrown up and swung--about 50 feet later. It was fun and really cool. Even 1 year old Theresa went down with her sister. And the 4 year old did a solo flight. Sam got blasted by the one kid's home made water gun on one ride. The 4 year old blonde girl was really cute. We watched as she pigged out and made a mess of her face in the raspberry bush. Tanya went inside pretty quick--she was too weak to stand around. We chatted with the Hanson's bit more about their sheep and their travels (wandered 5 months looking for a place to live 4 years ago!) and then said goodbyes to all and got a loaf of bread. We drove, as it got dark, to the coast, at Florence. It was kind of late so we thought it a waste to buy a campsite. So we pulled up at a beach and slept in the van.